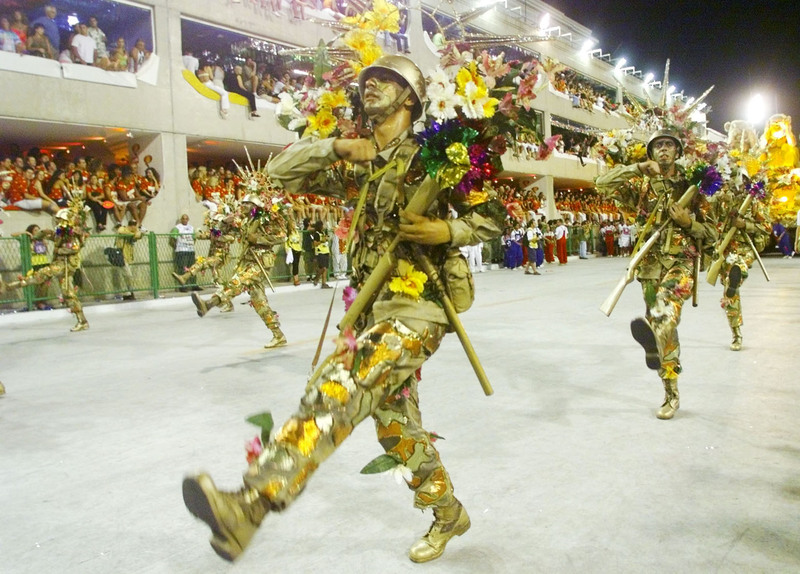 Goose-stepping carnival revelers from the Uniao da Ilha samba school parade in a parody of military dictatorships at the Sambadrome in Rio de Janeiro March 6, 2000. Argentina’s peso has shed more than 50 percent of its value so far in 2018, as of Sept. 11. In announcing emergency austerity measures on Sept. 3, President Mauricio Macri said: "This is not just another crisis. It has to be the last." His government is seeking accelerated disbursements from a $50 billion loan program agreed with the International Monetary Fund. Jair Bolsonaro, a far-right former military officer and leading candidate in Brazil’s Oct. 7 presidential elections, is recovering in hospital after being stabbed in the abdomen during a campaign rally last week. Mexico has postponed new bidding rounds in the liberalization of its oil industry until after President-elect Andrés Manuel López Obrador takes office in December. López Obrador, a critic of the program to attract foreign and private investment in the sector, says his government will invest heavily in ramping up the output and refining capacity of state oil company Pemex to reduce fuel imports and cut fuel prices. Venezuela's foreign minister on Sept. 8 accused the United States of supporting military conspiracies, following a New York Times report that U.S. officials had met with Venezuelan military officers to discuss a coup plot against President Nicolas Maduro. Maduro’s socialist government has presided over a collapse in the country’s economy, with inflation forecast by the IMF to hit 1 million percent in 2018.